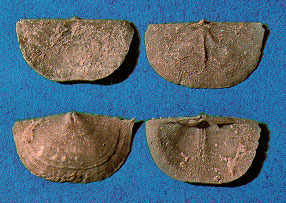 Brachiopods Click your browser''s "BACK" button to return to the previous page. Brachiopods are marine animals. Modern brachiopods are worldwide in their distribution, occurring in the cold waters of the polar regions as well as the warmer waters of the oceans. They occur at depths ranging from the high-tide line to 5650 meters (2,900 fathoms or 17,500 feet) down. Brachiopods live predominantly on the bottom, normally attached to rocks or other objects on the sea floor, although some species live burrowed into the sediment. Exclusively marine, brachiopods feed on micro-organisms and organic debris which is present in the water. Modern brachiopods range in the size of their shell from less than 5 mm (1/4 of an inch) to just over 8 centimeters (3 inches). Fossils brachiopods generally fall within this size range, but some adult species have a shell of less than 1 millimeter across, and a few gigantic forms have been found measuring up to 37.5 cm (15 inches) in width. One particular brachiopod, Lingula, which is found in the waters around Japan today, has survived relatively unchanged for the last 400 million years. A common name for brachiopods is "lamp shell" because when the shell is viewed in profile it resembles an ancient Roman lamp. Brachiopods are divided into two groups. There are the inarticulate brachiopods, which range from the early part of the Cambrian period to the present day, and lack a hinge. Their two valves are held together only by the muscles of the animal. A majority of inarticulate brachiopods are small and rounded, with Lingula as a typical example. Then there are the articulates, or those with hinged valves. Articulates have shells that are hinged by teeth on one shell, and sockets on the other, keeping the shells in line. Articulates were seen in the Cambrian Age but were not in abundance until the Devonian Age. A brachiopod’s shell is bilaterally symmetrical or symmetrical up and down, not left and right. Brachiopods are usually small, and no greater than one inch, but some grow to four inches or more. Some have smooth shells but most have ribbed shells. Though bivalves are often confused with brachiopods upon first glance, they have distinct differences. Brachiopods are actually quite different from bivalves in their anatomy and they are not closely related to the molluscs. Brachiopods are distinguished from the bivalves by the symmetry of their valves, as the valves of bivalves are usually not symmetrical. The pedicle valve is usually larger than the brachial valve and it always has a stronger beak. A stalk (pedicle) usually emerges from the beak of the pedicle valve and attaches the brachiopod to the sea floor. Both valves of bivalves by comparison are usually the same size. Though similar in appearance to bivalves, the shell of a brachiopod commonly shows ornamentation in the form of radiating ridges. Some species have a smooth shell, and concentric growth rings may also be present. To learn more about bivalves, just click on the icon below. Brachiopods were most diverse during the Devonian period, as just over 200 different genera have been found for that time. Brachiopods were much more diverse and numerous during the Paleozoic era, which corresponds to the periods Cambrian, Ordovician, Silurian, Devonian, Carboniferous and Permian. They diversified into a number of different morphologies and even participated in the build-up of ancient reefs. Most of the 30,000 known fossil species come from rocks of the Paleozoic era. Between the Permian and the Triassic, there is a drastic drop in the number of brachiopods. In fact, fossil records of many animal groups show this enormous die off, providing a boundary in time of a mass extinction. This was the largest of all extinction events, killing nearly 90 percent of all species alive at the time. Even though brachiopods have never been as diverse since that event, and despite brachiopods relative obscurity today, they have a long and rich paleontological history. To see our own collection of brachiopods, just click on the image below, and take a look. Please keep checking back to see what we have added. Please send any suggestions for the brachiopod page to us. For more information on The History House, contact The History House.